Well would you look at that! The Far Cry 2 space is going live in PlayStation Home, allowing players to explore the African landscape of the game, including a burned-out bus station and the offices of one Reuben Oluwagembi, a journalist whose files are chock full of information on the warring factions from the game. There's even a playable version of the game Mancala that uses bullet casings as playing pieces. Amazing! You know what would be even more amazing? 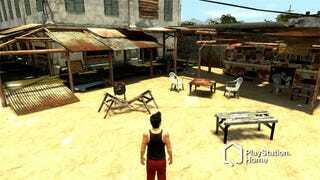 If we were actually able to get into PlayStation Home and see it! It's great to see developers are already supporting the feature and all, so once it does go live it won't be like waiting for trophy support to kick in, but come on already! Bah. Hit the jump for a couple more screens of things only people in the closed beta will be seeing anytime soon. UBISOFT® UNVEILS THE OFFICIAL FAR CRY® 2 SPACE IN PLAYSTATION®HOME’S CLOSED BETA Far Cry® 2 is the First Third-Party Game Space Featured in PlayStation®Home SAN FRANCISCO, CA – October 16, 2008 – Today Ubisoft announced the launch of the official Far Cry® 2 space in PlayStation®Home’s closed beta in North America and Europe. Featuring details from the game’s expansive open world universe wrapped in what will become a fully interactive experience, the Far Cry 2 space marks the first third-party video game environment in PlayStation Home. PlayStation Home is a 3D social gaming community that allows PLAYSTATION®3 computer entertainment system users to meet, chat, plan and launch into games together. Gamers can create their own custom avatar, decorate their personal apartment, play mini-games, shop, watch videos, attend special events and much, much more. “We’re absolutely thrilled to collaborate with PlayStation on this ground-breaking endeavor and have Far Cry 2 be the first third-party video game to have an official space in PlayStation Home,” said Tony Key, senior vice president of marketing and sales, Ubisoft, U.S. “Far Cry 2’s open world setting offers players a level of immersion that very few video games can match, and bringing that robust and dynamic environment to PlayStation Home will allow players to further engage themselves in the game’s gritty African setting in fun and interactive ways.” As Far Cry 2 pushes the envelope with the dynamic nature of its gameplay and environments, so will its official space in PlayStation Home. The Far Cry 2 space will continue to grow and evolve alongside PlayStation Home, with future additions of new interactive features and functions to create a living, growing platform for both the Far Cry and PlayStation communities. The recently launched Far Cry 2 space in PlayStation Home opens the doors for players to explore the interactive area containing a wealth of information about Far Cry 2’s missions and non-playable characters, in addition to other strategic elements of the game. Among the available activities will be a multiplayer game of Mancala that will use bullets as game pieces, the opportunity to explore in-game environments including a bombed-out train station that has been turned into an ad hoc café, as well as the ability to launch the game directly from the PlayStation Home space.